In large stockpot heat oil over medium heat. Add onion and cook 4.-5 minutes. Add asparagus and cook for 2 additional minutes. Add garlic and cook for 1 additional minute. Add chicken broth, parsley, dried oregano and onion powder. Bring to low boil and simmer until the asparagus is tender; approximately 15 minutes. Add cubed baked potatoes and simmer for 2-3 minutes. 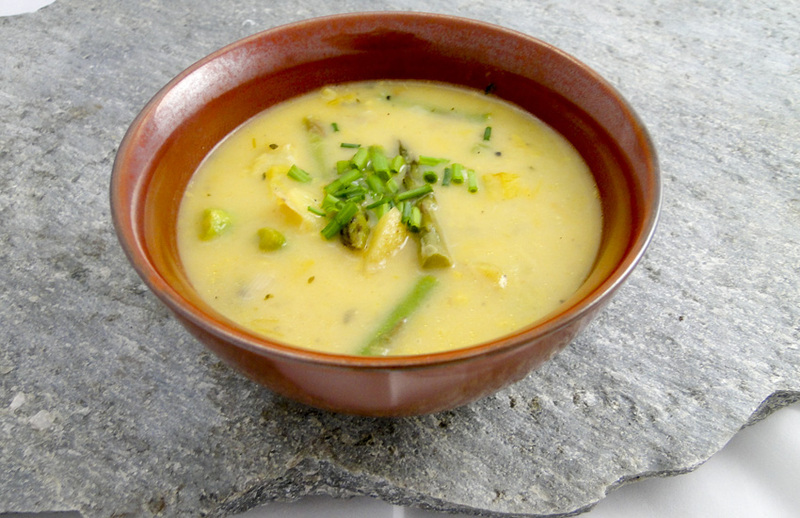 Remove 2 cups of the soup with slotted spoon (trying to capture mostly asparagus, potatoes and onions) and place in large deep bowl. Using immersion blender or mixer on high speed blend until smooth. Stir back into soup and slowly add cream. Melt 2 tablespoons of butter in microwave safe bowl. Stir in flour to slowly make smooth paste. Using slotted spoon or fork slowly stir this into the soup. Salt & pepper to taste. In small saucepan melt 1 tablespoon butter over medium low heat, Add panko bread crumbs and cooked bacon. Cook for 1 minute stirring several times.